You are currently browsing the archives for the Metrocrats category. As I watched the body camera footage of Thurman Blevins death, I was struck not only by the end of his life and the hard questions it raises, but by the beginning of the video. From the first moment officers are on scene they are loudly swearing, and threatening a man who appears to be sitting on a curb with a woman and child. From the first moment the police are shouting, scaring him, pushing him, and engaging in a way that led to the awful ending of his life. He ran, yes. He was armed, yes. He reportedly was drunk and had fired shots, yes. All of those things might have led to his death, but none of them had to. I don’t understand why calmly starting a conversation wasn’t an option or wouldn’t have been a better course. I don’t know much about Thurman Blevins. Had the officers approached the situation differently he might be in jail right now for firing his weapon into the sky and ground, or could be sitting on that curb with his family enjoying a morning off. I don’t know. When a man (or woman) wields a gun, that officer has a responsibility to protect himself/herself and their partner. That isn’t a situation where the officers have a ton of options. It’s literally a kill-or-be-killed situation. Notice how Rep. Murphy blames the officers, not Mr. Blevins. Rep. Murphy, if you were faced with this life-or-death situation, would you take a pacifist’s approach? Would you let a person who has a gun wave it around? If that’s truly what you’d do, there’s a high probability that you’d be shot. Further, by taking the pacifist’s approach, you’d put your partner’s life in jeopardy, too. More protests are expected in Minneapolis over the decision not to charge officers involved in the June 23 deadly shooting of Thurman Blevins. The two Minneapolis officers involved say he pointed a gun at them during a short chase. CBS News’ Dean Reynolds spoke to Blevins’ sister and cousin who dispute the officers’ version of events. Blevins’ sister Darlynn and cousin Sydnee Brown admitted he had a gun on him but say he was scared for his life when he ran from police. Let’s state something here emphatically. Gov. Dayton’s reckless statements after the Philando Castile shooting contribute each day to the tension between minority communities and police officers. Gov. Dayton said that “Would this have happened if those passengers, the driver were white? I don’t think it would have.” Since that day, tensions have escalated. Rep. Murphy’s statements just further escalate the tensions. According to this report, Murphy had less than $75,000 cash-on-hand as of 3/31/2018. 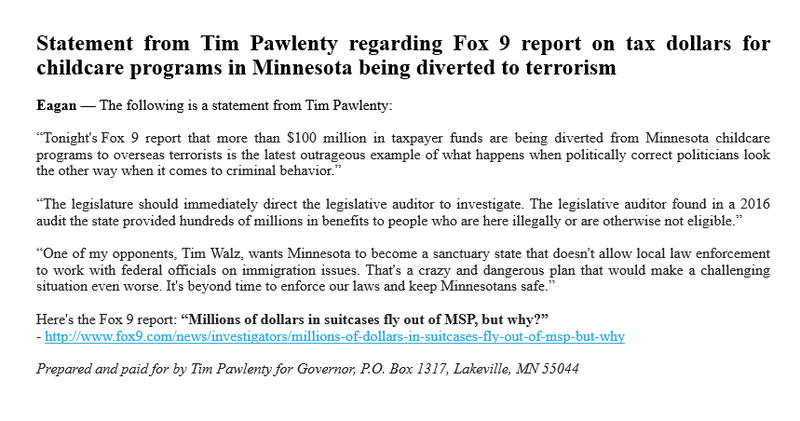 By comparison, Tim Pawlenty has $900,000 more cash-on-hand. On the DFL side of things, Tim Walz has almost $650,000 cash-on-hand. Let’s get serious here. With the DFL’s help, Erin Murphy should win the DFL Primary. The minute the primary is over, though, she’s in trouble. The bad news for the DFL is that her competitors on the DFL side are in worse shape. With the DFL having been taken over by Our Revolution, Murphy is the only candidate extreme enough for that organization. Lori Swanson and Tim Walz will split the outstate vote. When they lose the primary, their voters are most likely to either not vote for Murphy or they’ll switch to the GOP. This won’t be a happy reunion. This is the DFL’s civil war. Republicans aren’t unified but the DFL is heading for outright civil war. The survey considered the candidates support within the district’s two major media markets, Duluth and the Twin Cities. Lee had a clear lead in the Duluth market, with 24 percent support, while Radinovich was second at 18 percent. Metsa finished third with 15 percent support while Kennedy had the backing of just four percent of those polled. Radinovich holds a clear lead, however, in the southern part of the district, with 17 percent support. Kennedy was in second place at nine percent, while Lee finished third at seven percent. Metsa came in at just two percent support. In other words, Metsa is tanking outside of his back yard. The last thing the DFL needs is for there to be a tough fight between the pro-mining people and the anti-mining activists as their 2 finalists duke it out. That’s what this is shaping up to be at this point. It’s impossible to forget, too, that Leah Phifer won all 10 of the ballots at the DFL CD-8 Convention, though she didn’t win the endorsement. Let’s remember, too, that Rebecca Otto’s only win in the Precinct Caucus straw poll was in CD-8. They might’ve gotten rid of Phifer but they haven’t gotten rid of the environmental activists. I expect Radinovich to win the primary because there will a significant turnout for the pro-mining Swanson-Nolan gubernatorial ticket in the primary in the Eighth. That shouldn’t be underestimated. However, it wouldn’t be wise to predict a Radinovich victory in November if the Erin-Squared ticket wins the gubernatorial primary. An Erin-Squared victory will likely have a negative effect on turnout in the Eighth District. 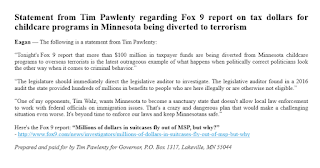 Thus far, Tim Pawlenty is the only GOP gubernatorial candidate to send me information on their campaign. Jeff Johnson’s campaign hasn’t shown any signs of activity, either in fundraising letters, campaign updates or through social media. At this point, I’m left to question whether Jeff Johnson is going through the motions or whether he’s just too broke to run a full-fledged campaign. Gov. Dayton has been a total disaster the past 8 years. Minnesotans are taxed far too much. Far too often under Gov. Dayton’s and the DFL’s watch, they’ve ignored warning signs of theft or fraud. It isn’t improper to call the DFL the party of big broken government. They’ve proven that they only care about oversized appropriations and no oversight. MNLARS continues unfixed. Meanwhile, Gov. Dayton vetoed a bill that would’ve saved deputy registrars from financial ruin that Gov. Dayton and the DFL caused because Republicans wouldn’t write Gov. Dayton a blank check for an additional $33,000,000 to supposedly finish fixing MNLARS. When the GOP insisted on strict oversight, Gov. Dayton went into another of his famous diatribes. Anyone that thinks rural DFLers and metro DFLers won’t duke it out over the Second Amendment is kidding themselves. This is one of the existential fights that DFL Chair Ken Martin has tried avoiding for 5+ years. Hamilton noted that “there is a growing schism between the party’s urban, liberal faction and its rural ‘Reagan Democrat’ pragmatic faction.” Here at LFR, I’ve been chronicling that schism for years. It’s inevitable that the divorce happen. Tonight on Almanac, the 3 DFL gubernatorial candidates did their best to spin the differences between rural issues and metro issues. They failed. Each played nice to a certain degree, though Erin Murphy definitely attacked Walz on the NRA. When rural voters hear that, it’s inevitable that they think the DFL is the party of gun grabbers. What’s clear is that these candidates either don’t understand rural voters or are too busy pandering to city voters. During the Roundtable, Eric Eskola mentioned the Eighth District DFL Primary. They’d run out the environmentalist in that race. Now, 2 more environmentalists have filed to run in the primary. These candidates won’t win but they will keep that fight fresh through August. That isn’t just a disagreement. Potentially, it might turn into a civil war. If the DFL can’t resolve these major differences, a divorce is inevitable. It’s just a matter of when. According to this article, the DFL thinks it’s got a messaging problem. While it’s true that they have a difficult time selling their agenda, their problem is substantive. It isn’t that they’ve got a failure to communicate. I’d argue that the DFL has a unity problem, which might turn into a shrinking party problem if the socialists persist in pushing their economic message. To reduce it to its simplest, socialism bets against human nature. That’s why they need tons of regulations, then tons of carve-outs for their friends when those regulations don’t work. People are in the process of rejecting that economic model. That, in turn, will lead to the party shrinking if this persists. Why would people be confused about this DFL? Shortly after the endorsements were announced, the Democratic field began shifting. U.S. Rep. Tim Walz made it clear he’ll take his gubernatorial campaign to the primary against the endorsed candidate, state Rep. Erin Murphy. 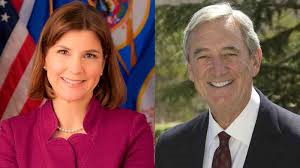 After Lori Swanson, the incumbent attorney general, lost the endorsement to DFL activist, Matt Pelikan, she decided to shift her focus to the governor’s race. Seeing an opportunity, U.S. Rep. Keith Ellison filed to run for attorney general, leaving his seat in the 5th Congressional District open. In response to Ellison vacating his seat, eight other Democrats entered the fray for his 5th District seat. What could possibly be confusing about that? LOL The thing that’s straightforward is that all of these tickets/candidates are extreme lefties. How do you message for their agenda? Good luck with that. In this convention speech, Mr. Ellison talked about selling people on climate change and other ‘progressive’ issues. BTW, never forget that progressive equals socialist. They’re inseparable. The prediction is fun reading but finding out that 13 DFL BPOU chairs have quit over the endorsement of the Erin-Squared ticket is important news. That indicates a major division within the DFL. Whether those chairs flip and vote Republican or not, it isn’t likely that they’ll vote DFL. People leaving the DFL because the DFL isn’t interested in people living outside the Metro is how you shrink the party. That’s a substantive issue or a philosophical issue, not a communications issue. I don’t think it’s a stretch to think that, as Minnesota’s Attorney General, Ellison would spend most of his time suing President Trump for ideological reasons. It isn’t a stretch to think that he’d become Minnesota’s Xavier Becerra or Eric Holder. Further, it isn’t a stretch to think that Ellison pictures himself as the Minnesota face of the #Resist movement. Further, it isn’t difficult to picture Ellison suing Minnesota police departments anytime that a black mad is shot by police. During Lori Swanson’s time in office as Minnesota’s AG, it was common knowledge that she spent tons of time suing President Trump. Rep. Keith Ellison (D-Minn.) is running for attorney general of Minnesota, setting off a potentially history-making battle that is sure to attract national attention. He officially filed the paperwork for his candidacy on Tuesday afternoon. Ellison, one of the staunchest progressives in Congress and the current deputy chair of the Democratic National Committee, would be the first Muslim statewide elected official in the country’s history. The six-term Minneapolis congressman would also be Minnesota’s first black statewide official. Let’s not be timid in saying this. Ellison is famous for being a bombthrower and a terrorist sympathizer. It’s impossible to see how he’d add anything productive to the state. UPDATE II: Mike Hatch has filed to run for Attorney General, too. In his speech, which sounded semi-sincere, he talked about people in “Ely, Zumbrota, Minneapolis or St. Paul” not getting their fair pay. Later in his rant, he spoke about “consumer justice.” Still later, he spoke about fighting for environmental standards, gun violence and the unions. Ellison won’t represent all Minnesotans. He’ll represent progressive Minnesotans. It’s impossible to think that he’d fight for gun rights, miners and small business owners. During his legislative career, both in the legislature and Congress, Ellison didn’t waste a split-second of time fighting for the middle class, blue collar workers or conservatives. Ellison is a radical’s radical. That’s who he’ll always be. 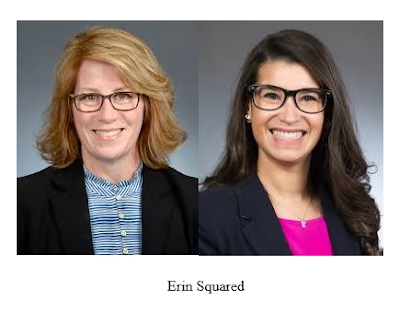 If you’re in the Twin Cities and you hear 2 women crying uncontrollably, it’s likely Erin-Squared crying because their chances of winning the primary just got vaporized. If you hear shouts of joy, it’s likely Ken Martin rejoicing after begging and pleading all night with them to come to his rescue. I wonder how big the bribe was to pull this ticket together. Erin Squared: the gun-hating ticket? I don’t know why I used the question mark in the title but it’s there and I’m too lazy to change it this morning. But I digress. The point of this post is to highlight the DFL’s gubernatorial ticket’s utter hostility towards legal gun owners. This morning, the Gun Owners Caucus issued a fact sheet on the ‘Erin Squared’ ticket vis a vis gun control. DFL-endorsed Lt. Governor candidate Erin Maye Quade, also an anti-gun State Representative who signed onto Linda Slocum’s egregious HF 3022 gun ban bill earlier this year only to later withdrawal calling it a clerical mistake. Her spouse is a former full-time employee at Michael Bloomberg’s anti-gun Everytown activist organization. Nothing says the DFL hates law-abiding gun owners better than an all-Metro, gun-hating ticket at the top of the ballot. DFL-endorsed Attorney General candidate Matt Peliken, an anti-gun attorney who has called for complete bans on many semi-automatic firearms under the guise of ‘gun safety’ legislation. He was introduced at the convention by the leader of the state-based anti-gun organization Protect Minnesota, Rev. Nancy Nord Bence. How do you think these candidates make rural DFL voters feel on gun issues? With this much hostility towards law-abiding gun owners at the top of the DFL ticket, it’s difficult to picture enthusiasm for the DFL ticket. Finally, check this statement out. Saying that picking Erin Maye Quade is Erin Murphy’s first unforced mistake isn’t controversial outside the DFL. Since I’m not in the DFL, I’m not that worried what the DFL thinks. Frankly, I’m confident that I’ve got lots of company in thinking that. Filling out Erin Maye Quade’s identity isn’t difficult. She’s admitted to organizing with Barack Obama in 2007-08. She’s led this year’s anti-gun protest at the Capitol. She’s from Apple Valley. Combining with Erin Murphy is natural since the DFL is the Metrocrat Party. Increasingly, to the DFL, life outside the Twin Cities Metro doesn’t exist. Increasingly, to the Metro DFL, people who want to protect their families are considered weird. If you don’t believe me, ask Lori Swanson how welcoming the DFL is to NRA members. Swanson led Matt Pelikan by 5 points after the first ballot. Shortly thereafter, the DFL endorsed Pelikan. After the first ballot, Pelikan dropped a neutron bomb in the convention center, telling everyone that — gasp! — the NRA had given Swanson an A rating. Within 15 minutes, Swanson withdrew. Quade first admits that she’s a first-term legislator. Next, she virtually admits that parents can’t afford child care. Perhaps, she should’ve told Gov. Dayton not to let several hundred million dollars leave the program as a result of fraud. Nothing in Ms. Quade’s legislative history suggests that she’s prepared to be governor if, God forbid, Murphy is incapacitated. Then again, I question whether either of these women are interested in representing the people of rural Minnesota. I’m betting they won’t. This ticket screams identity politics. This ticket doesn’t seem interested in representing all of Minnesota’s 87 counties. In the end, that’s why I think Murphy-Quade will get beat by Walz-Flanagan.